Dear Ken Thanks for your inquiry. We have finished the renovation of 3 bedroom villa. It comes with 2 queen beds and 3 single beds in the bedrooms. Full kitchen, lounge area, 2 bathroom, private garden are also included. Photos will soon be available online. If you wish to book, please give us a ring and we will be able to assist you. Thanks for your stay and wish to see you soon in the future. Dear Ronald Thanks for leaving your feedback. We are happy that you enjoy your stay. Wish to see you soon in the future. Dear brett Thanks for your review. 10/10 means a lot to us. We will keep updating the facilities and rooms at Park Squire to meet the needs of our customers. Wish to see you soon in the future. Room was clean and comfortable. However, they were undertaking renovations or something and there was a lot junk lying around which really needed skip bins or something as it was a bit of an OHS concern. Otherwise highly recommend. Dear Nicole Thanks for your comments. We are happy that you enjoyed your stay here. We take out construction waste off the property regularly, it shouldn't be a problem. Thanks for your suggestion and wish to see you soon in the future. Very good once again - we have previously been in the apartments up the back on many occasions - this was our first time staying in the motel section. Very nice. Dear John Thanks for coming back. Yes , apartment will be same standard as motel once the renovation is finished. Wish to see you soon in future. Traffic noise was horrible. Maybe consider double glazing on the window? But the air con was quiet and easy to control, plenty of power points and lights, giving our proper milk at the start of the stay was excellent as was having mugs and biscuits. Dear Sue Thanks for sharing your experience. We are happy that you enjoy stay here. All the motel room are equipped with double glazed glass. As we are located on busy road, we can not stop the noise for 100%. Please let us know if you are a light sleeper, Please ask for a room towards the back, it will be more quiet than the front rooms. Very good and I was impressed with the renovations. Had a great stay, cheers. Dear Mitchell Thanks for sharing your experience. We are happy that you enjoyed your stay. Parking is normally not an issue , we do have some alternative parking area as well. Wish to see you soon in future. Dear Deeann Thanks for sharing your experience. We are happy that you were overall satisfied with your stay, wish to see you soon in future. THis accommodation definitely exceeded our expectations. The apartment we were in hadn't been renovated yet, so was a bit shabby, but was clean and excellent value for money. Also important to us was that it was away from the traffic noise as the motor inn is on a very busy intersection. We shared the 1 bedroom apartment with our adult daughter, who had a full size bed in the living room and was very comfortable. The apartment had everything we needed for our 6 night stay, including iron, hairdryer, good sized fridge/freezer, and plenty of space. Also the aircon worked brilliantly - important on those super-hot Melbourne days! Dear Margaret Thanks for sharing your review. We are happy that you have had a lovely stay. We will surely keep the price affordable once all the apartments been upgraded. We wish to see you soon in future. The room was very fresh and clean; bed quite comfortable and very good shower - which is exactly what we were wanting. Given the position the room was relatively quiet - we slept well! Dear Peter Thanks for sharing your review. We are happy that you had a comfortable night in Park Squire. Lets see you shortly in future. The room was a good size, modern, clean and comfortable. Great location - walk across the street and take one the trams that pass by every 10 - 15 minutes. The trams make the local restaurants quite accessible even though the nearest food outlet is about 10 - 15 minutes walk. Dear Michael Thanks for leaving your feedback. 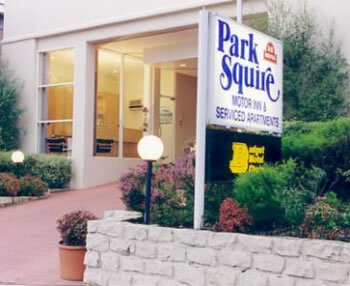 It seems that you enjoyed your stay at Park Squire, wish to see you soon in future. Dear Simon Thanks for staying with us. We are happy that you enjoyed your stay and we wish to see you soon in future. Dear William Thank you for sharing you experience. We are happy that you enjoyed your stay and we wish to see you soon in future. Almost perfect. Only sink was in bathroom, only cutlery were the three spoons, supplied with the mugs. No water jug, no cold water or milk in fridge. Basic amenities. Beds were comfy, water was hot, curtains kept the light out. reasonable price. Good enough for me! Dear Jennifer Thanks for staying at Park Squire , Milk are supplied at reception upon check-in. There is also a cattle in the room as well. Thanks again for booking with us and we wish to see you soon in future. Very happy with the service and staff at Park Squire and I am sure to be back again. Very pleasant. Great location for our purposes. Easy to get to and from. Well serviced with both train and tram services. Good car parking area. I have stayed before and have always found it pleasant. This stay I had my wife and 8 yo daughter and stayed in a new room, very good experience. Dear James Thanks for sharing your experience. We are happy that you enjoyed your stay. See you next time. Dear Annemaree Thanks for your taking time to leave a feedback. We welcome to see you next time. Dear Jane. Thanks for sharing your experience and we wish to see you soon. Dear shaun. Thanks for sharing your experience and we wish to see you soon. Dear Sean. Thanks for sharing your experience and we wish to see you soon. It was good. The owners/managers are amazing and very helpful. The accommodation is very tired, but I know they are renovating. The shower was terrible for me (I'm tall) but that's a minor problem which can be dealt with! Mostly our only complaint was the smell of smoke as soon as you entered the building from people smoking outside and inside. Dear Kylie Thanks for sharing your experience . We understand smoking do bothers non-smokers. Smoking is not allowed inside the room or buildings at all by our policy and we do encourage smokers to smoke away from the buildings. We might put more signs and set a smoking zone for smokers in future. Thanks again for bring this to our attention and we welcome you to stay with us in future. Comfortable, quite location. Good set up in the apartment, modern appliances. Comfortable stay good location and free parking. Bed was comfy and the new renovations are great. Staff very nice. Dear Patricia Thanks for leaving comments. Our brand new motel room is surely a gem in north Melbourne and Parkville. Dear Joel. Thanks for leaving great comments. Our staff work very hard to meet our customer's expectation year and year. We really appreciated for your Big Yes. Great stay, very hard to get into the front gate when coming from the freeway. Have to do an illegal U turn to get in. Needs a back entrance. Room is pretty good and service good too. I had trouble with my shower drain, it was very slow.. and i was standing on the dirty water till i finish the shower.. told the reception when vacated..
Dear Arvinth. Thanks for sharing your experience. This problem has been brought to management and it has been fixed. Thanks for the heads up we welcome you to stay with us next time. Dear Emily. Thanks for choosing us and we wish to see you soon. Dear Kylie. Thanks for your continuous support and we wish to see you soon in future. The only issue I had was wife the tiles on the floor within your wet area. They are incredibly slippery when wet and your bath mat isn't nearly big enough. I'd get a bigger mat if possible. Have stayed here many times. Would recommend to anyone travelling to Melbourne. Dear TAMARA. Thanks for been loyal with us. We surely welcome you and your friend to stay here when you visit Melbourne. Good service, friendly staff, very clean room. Dear Lien Thanks for choosing us. We do have a vending machine that provides snacks onsite. Thanks again for your stay. Close to the RCH, excellent water pressure in the shower. Bit tough to get back on Flemington road (Push in required) but thats a city thing. Dear Peter. Thanks for leaving your experience. We are in walking distance to RCH, it really helps people have to stay near the hospital. Melbourne is getting busier than before but that means it is a great city to stay:) Wish to see you soon. Apartment was very dated, but clean. Kitchen had everything we needed, but fridge didn't work very well. Staff were friendly and helpful. Dear Ian. Thanks for sharing your experience. Our 1 bedroom apartment are about to get refurbished . It works well for our customer at this stage. However , as you said, it was dated. Please keep checking us once renovation is finished. I can assure you, it will be fantastic. For now, our newly refurbished motel room might works best for you. We've now stayed with Park Squire upwards of half a dozen times, and each and every time it's been comfortable and convenient with top level service. Thanks for everything!